ProtectMyID.com is brought to you by Experian, a trusted and reliable company with years of experience. This is reflected in the overall quality of the site and the services it provides, which are comprehensive and professional. 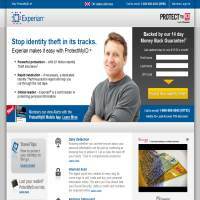 This site gives you all the usual protection with a few extras that make it stand out somewhat from a lot of its competitors. It also offers travel advice and a discount for clients who are over 55. One of the more unusual features on protectMyID is its daily detection and “all clear” alerts. Essentially these combine to provide regular updates, even when there’s nothing for you to worry about. Whether or not you want this extra feature might be up for debate though as, while some people might be happy to have the regular reassurance, others may find these updates unnecessary. It all depends on whether you’d rather just know when something is amiss, or if you’d feel safer with daily acknowledgements. Another feature that you won’t find from all identity theft protection services is a mobile app that allows you to access your account and reports when you’re on the move. This will be particularly useful if you’re away on business regularly, or plan on travelling. In fact, the site seems particularly suited to travellers, especially since it offers a range of travel tips for free. You can also download these tips and print them out, so they’re handy to take with you. If you’re worried about losing your wallet then ProtectMyID also provides a lost wallet service that ensures you will receive professional help with regard to cancelling cards and making sure that your personal information isn’t used against you. The site has a decent amount of information on how to protect your identity, including over 40 articles. You can find out about the various risks, how to defend against them and what to do when all else fails. This information is provided for free, and it’s worth reading over even if you’re not going to pay for an identity theft protection service. You can contact customer services via phone (US number), by post or email. However it would be useful to have a live chat option, because calling from abroad might not always be a viable option, and if you’re in an emergency and need their help then you won’t want to be waiting on an email response. With prices starting at almost $16, the total cost of your services may come to considerably more. As such Protect My ID isn’t necessarily the cheapest option around. However, it still provides good value for money as its services cover most of the concerns you’ll encounter. You can also protect your kids’ IDs, if you so choose, and monitor your address to make sure that your bills and statements haven’t been used in a fraudulent change of address scam through the post office. Whilst ProtectMyID doesn’t offer the most spectacular identification fraud protection services available, it does offer all the core services at a reasonable price. Given the site’s associations with Experian and its general professional feel, guarantees and employment of identity protection specialists, we’re sure that you’ll be pleased with what it has to offer.